You've probably never heard of Torrey, Utah. It's a small town, 171 people according to the 2000 census. It may not be quite the middle of nowhere, but you can see it from here. Torrey consists mainly of a handful of motels, most of them closed for the season. 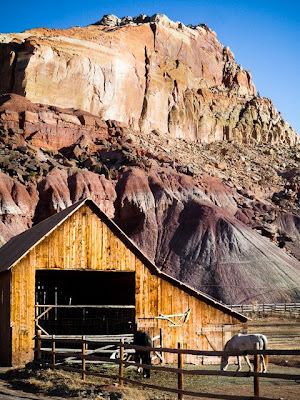 It no doubt owes its continued existence to Capitol Reef National Park, Utah's least-visited national park, eight miles to the east. The dining options in Torrey are limited. In fact, discounting the "Taco Time" at the Texaco station, the dining options at 7:30 on a Saturday night are precisely two: "Fine Dining Restaurant" at the Best Western, and a pizza place across the street. I idled in the road a moment, trying to decide, then hung a right into the parking lot of the pizza place. I grabbed my book and went inside. That's strange, I thought to myself, I could swear I just heard someone say my name. I sure would feel like a fool, looking around to see who said my name in this pizza place in this tiny little town in southern Utah, because clearly I'm not going to know anyone here. I looked around anyway. And there were Jesse and Dave, two friends from Minnesota. We used to work together at Adobe. With them were three other Adobe folks, Nick, Mike, and Zack. So, I didn't end up sitting at the bar after all. Ben, glad you liked the Capitol Reef area and Torrey. Just wanted to point out that though you are correct about most places being closed in the winter the town is beginning to wake up right now. The Chuckwagon motel, which has a grocery store and a deli has opened for 2009, as has Slackers Burgers (formerly Brinks). Pretty soon the highly regarded Cafe Diablo will be open together with the Capitol Reef Inn restaurant. Most of Torrey is west of the 12/24 junction and people do miss it when going from Bryce to Capitol Reef. It was very weird to see you in Utah. But good. Catch up with you perhaps back in MN some time. Now imagine if you had taken a left and gone to the Fine Dining Restaurant instead. You would have missed your friends and never even known that you did. I think about this sometimes and wonder for every time we do run into someone, how many times have we just missed? It really does make the world much smaller. I think the same thing, Sara. How many coincidences almost happen, but not quite? Who knows who I would have met if I'd gone into the Fine Dining Restaurant instead. I was at the Fine Dining Restaurant. I camped at a little spot right at the junction of 12 and 24. I had one of my most amazing motorcycle rides through that area. I love Capital Reef. The hike that takes you up to look over Fruita was a classic. I will keep a watch to see what you post here. Hi Laurence, thanks for the comment. I agree, I just love this area (which is the subject of the post I'm writing now). I think that Highway 95 between 24 and 191 might be the most beautiful stretch of road I've ever driven. sleep deprivation also leads to typos.